When you're ready to take your photo editing seriously, you're faced with the question that every photographer eventually must answer: Photoshop vs Lightroom? I've answered this question hundreds of times before with those who take my online Photoshop and Lightroom classes for beginners, so I'll do my very best to explain it in a way that will be crystal clear. In short, Photoshop is meant for making significant changes to a photo by using a vast array of tools. Lightroom is meant for very quickly organizing your entire library of photos and making the most common edits to them quickly. Most professional photographers use Lightroom for 90% of our photo editing, but occasionally take specific photos into Photoshop if a more complicated edit is needed. 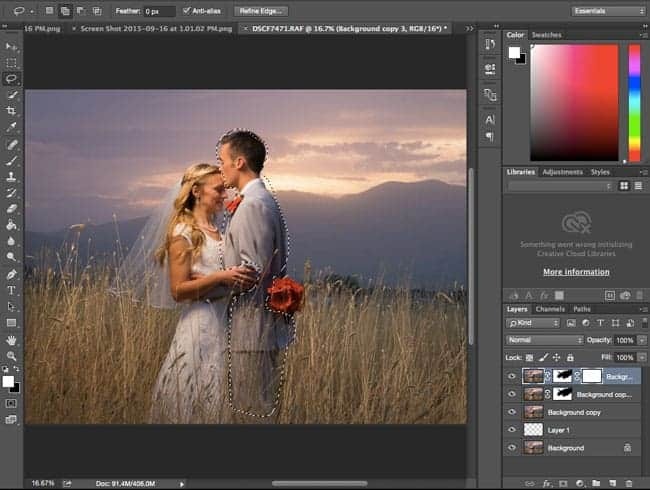 The two programs approach image editing differently, but since they are both made by the same company (Adobe Systems), they mirror each other in terms of compatibility and have similar tools. This is typical of what it looks like in Photoshop while you're working on a photo. The picture is in the middle with tools scattered all around the screen and hundreds more in sub-menus. Photoshop is incredibly powerful, but overwhelming at first. That's only relevant because it means Photoshop is a gargantuan program that needs to please the needs of many types of media makers, and it shows up in a clunky and complicated interface. There are at least 3 or 4 ways to create just about any effect in Photoshop with different sets of tools. Even though I'm one of the largest providers of Photoshop training online, I still find new tools and techniques in Photoshop all the time. It's a MASSIVE program. You can even edit video in Photoshop! ANYTHING is possible in Photoshop. If you can imagine it, you can make it with enough skill. Want to put a duck's head on the body of a chihuahua? You want Photoshop. But it can also be used for simple things like removing a telephone pole from a landscape, doing advanced skin smoothing on a model, or resizing a photo. This is what a photo looks like opened up in Lightroom's develop module. You see all your photos at the bottom to choose from, a large preview of the picture you're working on, and all your tools for making edits in one place. 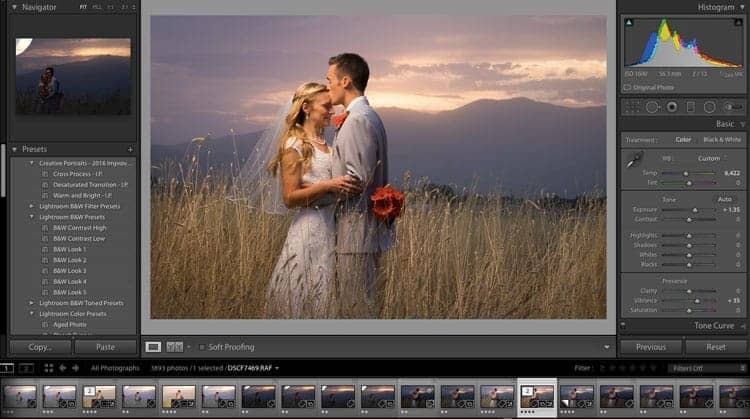 What is Lightroom and who is it for? Lightroom is designed with only one audience in mind: photographers! 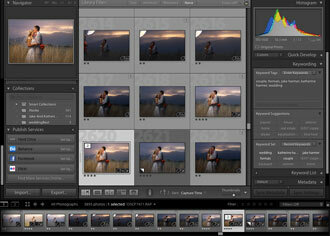 The interface of Lightroom is much more intuitive for new users, and faster for advanced users. The newer interface is largely a product of the release of the software (Photoshop was first released in 1988 and Lightroom was released in 2007). Lightroom's goal is not to give photographers every imaginable tool for doing deep surgery on a photo, but instead to take most popular tools and effects that photographers want to accomplish and make them fast and easy to apply to a shoot's worth of pictures. Lightroom is a powerful image management tool. If you're trying to find a picture of your trip to Disneyland from 10 years ago, you could search by date, the keyword “Disneyland”, the faces of the people in the photo that Lightroom magically finds, or a dozen other ways. That means that your entire photo library is neatly organized–finally! The other cool thing about Lightroom is that all edits are non-destructive. That may be a little hard to understand now, but you'll eventually see what a big difference it makes. I'll discuss this in detail in the “What can you do in Lightroom that you can't do in Photoshop” section, but this basically means that you can always go back and tweak or undo changes you make to a photo–even if you wait years to change your mind. Photoshop's sharpening tools are extremely robust, but also very confusing. When it comes to making changes to a photo, there is nothing you can do in Lightroom that you can't do in Photoshop. “Layers” is the most significant thing that Photoshop does that Lightroom cannot. A layer means stacking different pictures or parts of pictures on top of a different picture to create a certain effect. Remember the duck and the chihuahua example? The chihuahua picture is on a layer, and then I cut out the duck head and put it on a layer on top of the duck. Since Lightroom has no “layers” functionality, it's impossible to composite multiple photos together in that program. That's where Photoshop shines. You can also use layers to take parts of a photo, select it, and put it on a new layer so that you can change the object's placement in the frame. 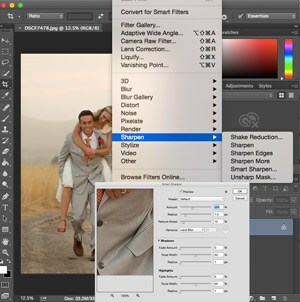 Photoshop also has a vastly larger set of tools for photographers to choose from. I'll give you an example of what that's like with sharpening. 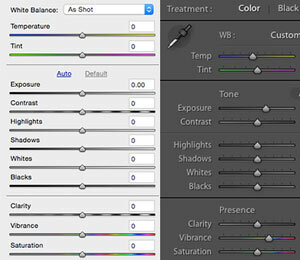 Lightroom has a basic image sharpening panel in the develop module and a simple output sharpening function. That's it. Photoshop has six different global sharpening methods (each complete with a panel full of potential settings) as well as tools for localized sharpening. One key tool that Photoshop has and Lightroom does not (at least not nearly as powerful) is content-aware fill. This allows you to select any area of the photo, and have Photoshop not only erase what is in that area, but to guess what would be there if the object were not in the way and fill it in with the background. It's absolutely incredible, and it's the tool I use most often in Photoshop. Lightroom's organization features are incredible! The library module allows you to organize by keywords, camera used, facial recognition of those in the photo, star rating, color rating, etc, etc. It's true that there are no edits you can make in Lightroom that you can't also do in Photoshop, but that ignores the fact that if you can make an edit in both places, the tools in Lightroom are almost always easier to use, faster to use, and can be tweaked at any point in the future. Non-destructive editing is the coolest thing in Lightroom, but it can be hard to wrap your head around until you've used it yourself. EVERY edit in Lightroom is non-destructive. Non-destructive editing means that the program remembers your change and shows you a preview of that change without changing the actual file you're working on until you export the photo. Here's an example of how non-destructive editing works. Let's say you take nice photos of your daughter on her sixth birthday. You apply a matte finish to the photo, which is a really trendy look right now (popularized by Instagram). 10 years later, for your daughter's sweet sixteen party (or 14 years later for a quinceanera), you want to print the photo, but you see it and say, “UGH! I can't believe I put that nasty matte finish on a photo! That's soooooo 2015!” With one click, you can reset the photo in Lightroom and you have the exact same photo that came out of your camera the day you shot it. The matte finish is gone. While Lightroom's edits are ALL non-destructive, most all of Photoshop's edits ARE destructive (though there are ways you can get back to the original if you worked on the photo the proper way and saved the photo to the correct format). Non-destructive editing also means you can go back and simply tweak what you did to a photo two days or two months ago. See a photo that you applied a little TOO much skin smoothing on? Just slide the setting back down and it's fixed. Your edits are never baked in to the original photo. Lightroom has a powerful set of photo organization and management tools that Photoshop does not have. When you import your photos into Lightroom, it neatly organizes them so you can find any photo you've ever taken within seconds. It's really nice to have everything organized so you never lose your precious photos. This is in stark contrast to Photoshop, which contains no photo organization tool. On the left, you see photoshop's raw editor (called Camera Raw). 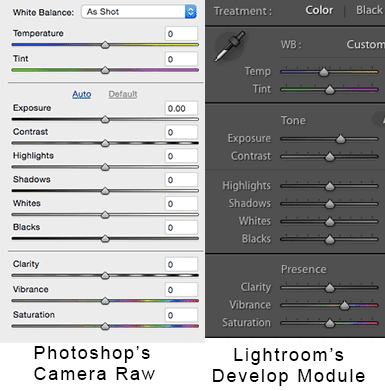 On the right, you see Lightroom's raw editor (called the Develop Module). They are practically identical. There is a part of Photoshop called “Adobe Camera Raw.” It's basically one of the panels within the program, and it was created long before Lightroom. In fact, the inspiration for Lightroom was to take this one part of Photoshop, and to put it on steroids. Camera Raw is where you make the basic edits to exposure, saturation of colors, brightness of the highlights or shadows, add input sharpening, etc. So when you look at the Camera Raw portion of Photoshop side-by-side with Lightroom, you see that the two programs are twins. Since both programs are both owned by the same company, features that appear in one program are likely to be brought over to the other program soon. For example, Lightroom first introduced the non-destructive crop tool, and then it was later introduced into Photoshop in the next version. Since Adobe released the Creative Cloud Photographer's Bundle that allows you to get BOTH the full version of Photoshop and the full version of Lightroom for just $9.99 per month, more and more photographers are using both programs together. This is a HIGHLY recommended setup. I would be lost if I only had one of the programs to edit photos with. They work together beautifully. Let me walk you through what your workflow might be like if you do this. When it comes right down to it, most photographers should choose Lightroom as your first editing program. It's the one that I use for 95% of my photography post-processing (that's jargon for digital photo editing). The reason I recommend Lightroom for most users is that it organizes your photos, is fast and easy to use, and allows you to make all of your edits non-destructively which is really helpful as you learn especially. However, some photographers will want Photoshop first, and just about ALL photographers eventually buy both of them to use together. The only real reason to choose Photoshop first is if you know for sure that you want to composite photos together and need layers. Also, if you're a photographer but also want to a program that will allow you to do graphic design, then Photoshop would be the clear choice. The good news is that you probably don't need to decide between the programs. You probably want both! If you buy the full version of Photoshop (About $500) and Lightroom ($150), you'd be spending WAY WAY more than Adobe's new Creative Cloud Photography Bundle. That gives you the FULL version of Photoshop AND Lightroom for just $9.99. It's what I use, and I love it. I normally hate monthly expenses, but this is a STEAL of a deal! Buy it on Amazon here. In fact, Adobe has made the decision easier when it announced that it will no longer even sell Photoshop as a standalone product. Now, the only way to get Photoshop is if you get the Creative Cloud and pay monthly. Again, I normally hate monthly expenses, but this one actually saves you a significant amount of money over the old boxed version. If you want to learn how to use Photoshop and/or Lightroom, you REALLY should sign up for my weekly newsletter (it's totally free). I email out one of my pictures, and ALSO the original unedited photo, and explain exactly the steps I used in Photoshop and Lightroom to get to the finished result. It's pretty helpful for learning the programs. Sign up for the newsletter here.